I have a new crochet dishcloth pattern for you. 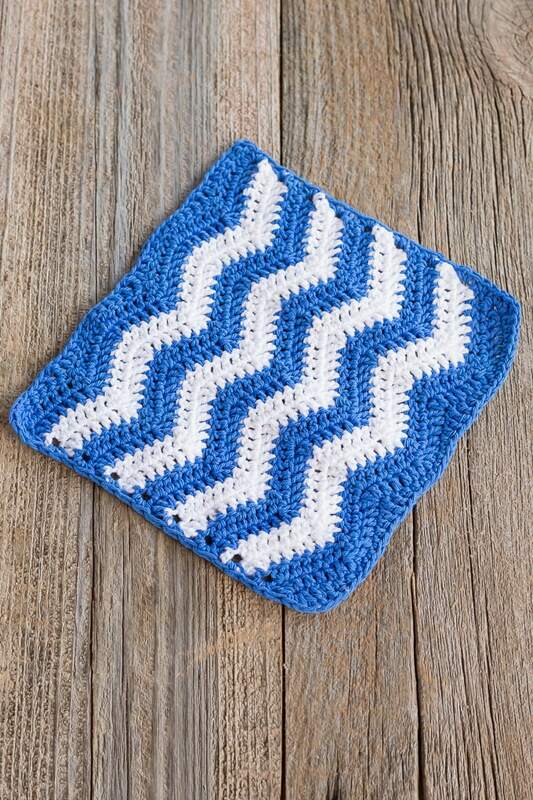 This one is a Ripple Crochet dishcloth pattern. I used to different color yarns in evenly spaced ripples. 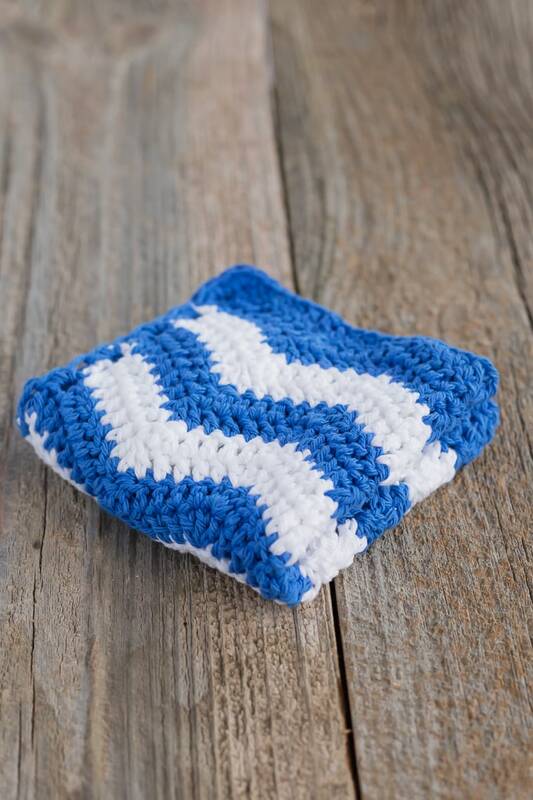 When working on this dishcloth, I used 100% cotton yarn in blue and white. I completed 2 rows of each color before changing. I also added a border to the dishcloth. It is not needed, but I liked the more square look instead of having the zig zag edges. I will honestly tell you, I did have difficultly learning this pattern for some reason. Part of it was knowing terminology. I read on thing and did something completely different. However, once I got past reading correctly, it is a very easy pattern to follow. 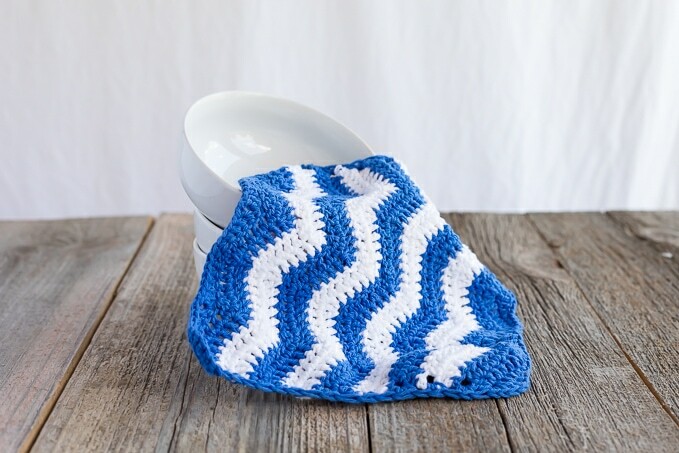 If you need help, I followed the Ultimate Guide to Chevron Crochet from Red Heart. It is nicely spelled out how to alter patterns and how to figure out the starting chain. Very informative. Dc3tog = This is a decrease in double crochets. You will double crochet 3 stitches together to create one stitch. 100% cotton yarn in 2 color choices. I used Sugar N Cream Blueberry and White. Digital Row Counter – I use one like this digital row counter. Row 1: Chain 36. Double crochet twice in the 4th chain from the hook (the chain 3 counts as a Double Crochet). *Double Crochet once into the next 4 stitches. Dc3tog. Double crochet once into the next 4 stitches. Double crochet 3 stitches into the next stitch. * Repeat from * to * until you reach the end. Row 3 – 18: Repeat row 2 for each row. Change colors of yarn every 2 rows. If you do not want an edging around the dishcloth, now is the time to cut your yarn and weave in the ends. If you do want an edging, continue on. Edging: Chain 1 and turn your work. Single crochet in the next 3 stitches. Half Double crochet in the next 2 stitches. Double Crochet in the next. Triple crochet in the valley of the ripple. (The Dc3tog stitch in the row before). Double crochet in the next stitch, Half Double crochet in the next 2. Single Crochet into the next 5 stitches. Repeat these series of stitches until you get to the end. It should fill in the valleys. Put 3 single crochet stitches into the corner. Put 2 single crochet stitches into each turning row down the side of the dishcloth. In the next corner single crochet, then Half double crochet and Double crochet. (this gets the corner taller to make a straighter edge) Double crochet into the next 2 stitches. Half Double crochet into the next stitch. Single crochet into the next. Single Crochet in the next 4 stitches. Half Double Crochet in to the next 2 stitches. Double Crochet into the next. Then triple Crochet into the valley. Keep following this pattern like before on the first side. Make the corner like before. This corner will be a triple crochet, double crochet and half double crochet stitches. Then single crochet twice into each turning chain row. Join back to where you started. Cut your yarn and weave in your ends. 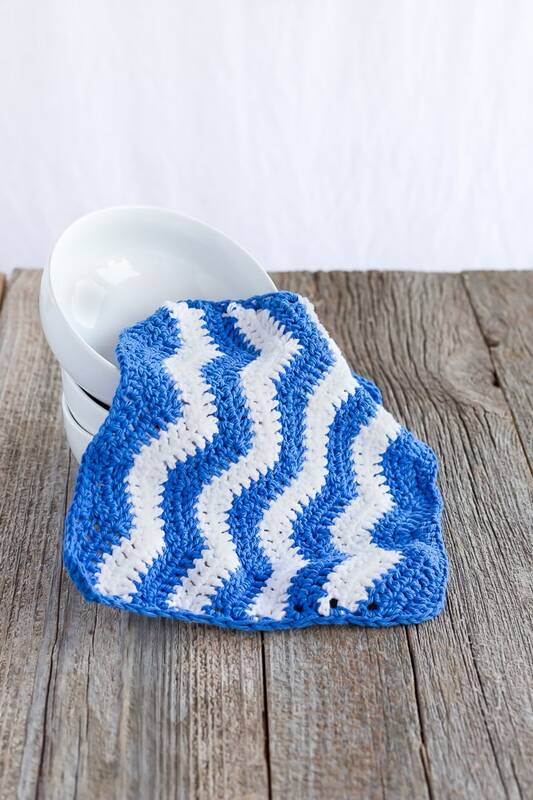 Enter your email below and an email will be sent with a link to print the pattern. Billie, I am not sure what you are asking. The pattern is written out above in the post.